22nd Leadership Lecture by Shri. 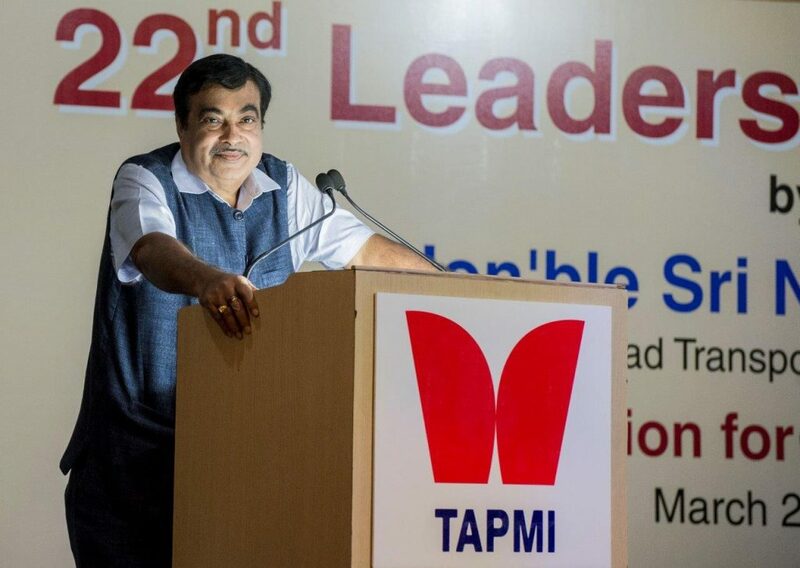 Nitin Gadkari at TAPMI. Leadership is about working collectively with people and maintaining good relationships, said Mr. Nitin Gadkari, Minister for Road Transport, Highways and Shipping. These words were spoken by him at TAPMI’s 22nd Leadership Lecture on the topic “Education for Development”. The problem lies not with the system but with the vision of leadership. Vision, with the help of knowledge, can lead to miracles, he said. Conversion of this knowledge to wealth is our future. Fast track decision making, transparency, commitment and courage to take risks are quintessential in these times. He shared his experiences as a minister and cited various inspiring stories along the way. He spoke of how the Government sanctioned him only rupees 10 crores to build the Mumbai-Pune Express Highway and the manner in which he was able to raise rupees 4000 crores from the capital market for the same back in 1997-98.He also spoke of how he managed to aid contractors to construct flyovers using only rupees 1000 crores in spite of having a budget of rupees 1800 crores. Moving forward, he spoke of how he could convince ISRO scientists, to carry out research on lithium ion batteries, for buses, to get a price tag of rupees five lakhs, whereas he had received a quotation of rupees 50 lakhs from other sources. He spoke of how favorable government policies can encourage in improving quality and help in converting waste to wealth. To end with he said that where there is a will there is a way. If there is no will, there is only survey, seminars and discussions. Dr. R. C. Natarajan, Director of TAPMI and Dr.Ramdas Pai, Chairman of TAPMI Governing Council and Chancellor of Manipal University were also present at the event.